Hello folks. I figure it has been a while since I shared any information with you on the re-release of Comes The Dark as well the other two books in the trilogy by Permuted Press. After all, they won’t be available until 2013, right? So there is some time before that happens. But of course, things are always happening behind the scenes. Comes The Dark has already been re-edited for the new version and is in the publisher’s hands. More to come on a release date-for paperback, ebook, and hopefully even an audible version (which will make some people I know very happy). Well, I wanted to share a bit of recent news with you which made me as giddy as a school girl. Well, maybe not THAT giddy, but I thought it was pretty cool. I was just show the new artists rendition of the cover for the book and it was, in a word, AWESOME! Nope, I can’t share any significant details with you at this time, mainly because it is still a work in progress, but suffice it to say that it will look completely different than the original cover…as will the covers for Into The Dark and Beyond The Dark. Now let me state very clearly that I absolutely love what Philip R. Rogers did with the original covers. He took my vision for the first cover and transformed it into something wonderful, and then did the same with the second and third books as well. He is an incredible artist and I love not only my covers, but just about everything else he has ever done for the anthologies I’ve been in and the other writers he’s worked with. His stuff has a distinctive air to it that is instantly recognizable to me. He tells a tremendous story with his images that draw the eye. The new covers have gone in a completely different direction. I’ll just say that there will likely not be a zombie in sight on any of the three, but for anyone who has read my books, they’ll see some things from the stories that they’ll recognize right away with what is on display. Just as a refresher, the new books will have a significant volume of new material-they’ve jumped from being three books at each roughly 60,000 words to each being anywhere from 80,000 to over 100,000 words each. Since much of that is the Dark Stories that I have posted on my website, but with even more additions, I will likely be pulling those stories down prior to the release of the books next year. I figure, if you haven’t read the rough versions of them already, you can check them out all polished up and shiny for the new books. In other news, I continue to work on the fourth book in this saga, which, as I have stated before, isn’t the fourth book in the trilogy (and I know saying a phrase like that sounds like a bad joke) but the start of a new two-book saga. A duology, if you will. The trilogy will stand on its own and these two new books will as well, though they will be tied together by characters and a shared world. The book has been outlined for a long time, but what I truly love about writing is how the story changes and morphs as I write it, so even I don’t know what to expect from page to page. It is a heck of a journey, and I look forward to sharing with you on down the line. I apologize that I don’t share more of what I write on a daily or weekly basis, but I’m a bit shy with that. I do have a plan though, to start sharing some of my zombie short stories, or some tidbits of them, that have either been previously released, or yet to be, just to keep you folks entertained a bit when you come to my blog. I know my reviews are just fascinating (har har!) but I hope some of my own work might be of interest as well. Until next time…which I hope will be in the next few days…see ya! Not too long ago, I mentioned that my trilogy, Comes The Dark, Into The Dark, and Beyond The Dark were being re-released by Permuted Press in 2013. Since I had agreed to do this, I have been working to reconfigure the manuscripts of each book. Each will be much larger than the books released by The Library of the Living Dead Press, with the Dark Stories I originally removed returning to their rightful place in each volume. There will be revisions and some new stories, in particular in the final book of the trilogy. One story comes from an anthology called Eye Witness: Zombie from May December Publications that stands alone, but happens in the same world as the rest of the saga. Another story will be about Lydia, a character that appears in the second and third books and is one of my favorites. At the suggestion of one of the folks who reviewed the trilogy, along with the Dark Stories that appeared in the e-book omnibus (you know who you are! ), Lydia is getting her day, and the story I am relating takes place several weeks before the events of the trilogy. Lydia is someone who was influenced by my mother and sister, who both passed away in 2011. Much like Megan, she is a strong, loving character who will do anything for those she cares for. I think this new story will demonstrate that even more than what occurs in the trilogy. Since it is all in the hands of Permuted and my new editor, I will be focusing my writing efforts on the fourth book. The initial chapter is a tricky one, and I have been over thinking it for some time, but it, along with the rest of the story, is coming together and I look forward to sharing bits and pieces of it with you as time goes on. More to come, so stay tuned! My article over at Indie Inside has gone live! I’d mentioned that I’d written a brief article for Pat Douglas, a fellow author, over on his website, http://indie-inside.com. It has gone live now, and I hope you’ll click on the full link and head on over there: http://indie-inside.com/the-joys-of-the-other-stuff-guest-blog-w-patrick-dorazio/. For anyone who has become a writer and believes that when they get published that they can just sit back and bask in the glory of being famous, this article is for you. It’s also for anyone else who ever wonders how you can get the word out on a writing project. Whether you self-publish, get with a smaller publisher, or manage to swing for the fences and get with one of the big publishers out of New York, much of the promotional work responsibility is in your own hands. There is tons you can do to help promote your stuff, and my article goes over just a small smidgen of that. So pleased check it out…it might make you cringe, but perhaps it will bring a smile to your face…because I tried to be funny (just a little bit-probably failed, but give me a B for effort). A cool website to check out. A word to the wise for those who are writers or plan on becoming one in the future. For the most part, my posts on this blog have been related to my work and the work of others: reviews, updates, and promotion of my work and the work of my fellow writers. There have been a few commentaries on my experiences in writing and I will admit there probably needs to be more. While I am far from an expert on how to get published or just in the craft of writing, I have learned a few things along the way and continue to learn new things every day. One thing in particular that I have learned is that there are so many people out there who genuinely care for one another in the writing community. They may make their living writing, editing, publishing, doing formatting…or they may be doing it more as a sideline-hobby/passion/dream of making it big someday (most of us are like that, in fact), or they are fans of the different genres: horror, science fiction, fantasy, bizarro, etc who have dreams of getting more involved down the road-maybe making movies, writing, creating their own publishing company, or something else. They pour their blood, sweat, and tears into what they do, and care about it enough to make sure they do the best job possible-not just for themselves, but for everyone else who is relying on them. Social media has allowed pretty much everyone to share their thoughts, connect, and join in the conversation with a very wide ranging community that is all over the globe. I’ve learned a lot from a lot of different people. Not just about writing, but about the business side of things-what it takes to get a book out there, how to promote your work, how do you hook up with filmmakers, etc. I’ve been lucky because I’ve associated myself with people who not only care about what they do, but they behave in a very professional manner. But you hear stories now and again about someone who steals stories from other authors and claims them to be their own, or publishers who refuse to pay the artists for the work they put out there. It is unfortunate, but the people who share their experiences and send out warnings pave the way for the rest of us to be able to avoid the same pitfalls, and because of that, we all are grateful to these brave souls. Sometimes the lessons are more simple, such as avoiding getting provoked by a review of your work that you disagree with. Tales of woe for authors abound on this front. This brings me to the main topic of this post. Yesterday, I saw two separate warnings posted on Facebook from two separate authors, both of which are fairly new to being published. Quite a few people have since shared their information with everyone on Twitter and Facebook that they know, and I am joining their ranks. As some of you know, I tend to keep my opinions to myself beyond of the topic of the writing I do or someone else’s work…and when I do comment on anything anyone else does, I do my best to be constructive and professional about it. I have avoided more flammable topics, but for right now, I feel it’s important that I share these two tales with anyone who reads my blog. Take away from them what you will. It is my hope that what has happened to these two writers doesn’t have to happen to anyone else because of what they’ve shared. The first post is from horror author Alyn Day. The second is from author Mandy De Geit. I think it is fair to share these blog posts with the world, as I think it would also be fair for me to share any rebuttals that the publisher has to offer to either or both of these authors, if I hear of one in the future. Because there is always two sides to the story, and even with the information shared above, I would be curious to see what response there may be to these accusations. It is a shame when things like this happen. But as so many others have said and I have as well, the fact that this information was shared makes all of us the wiser and more prepared as writers going forward with our efforts. So always be alert and concerned about what is going on around you as a writer. Find out as much as you can about a editor, a publisher, and everyone else involved in working with you before you hand your pride and joy over to them. Just as you expect a mechanic to be trained to work on cars and a doctor to have a medical degree before you let them tell you to bend over and cough, you should know the history of who you are looking to work with in advance of agreeing to anything. But if you do end up making a mistake (and we all have, on many different occasions), don’t hesitate to share with others, so they can learn and avoid those same mistakes. Guest Blog from author Kody Boye! Every once in a while I get the chance to do something fun because of this writing and reviewing gig I have created for myself. No, I haven’t gotten a space on the next commercial flight up to the international space station, but that would be cool, wouldn’t it? But unless I become a bajillionaire, or they start giving those away for free, I am out of luck on that account. There is much debate as to what zombies represent in the media and fiction. Some say they are a result of our lesser reptilian conscience coming to life in the most stressful of situations; others say that they are meant to reveal the most intimate flaws that exist within each and every one of us. To a writer, zombies can mean many things. Life, death, the present, the future, the past, what happens to us after death and just where our minds (or our ‘spark’) go—we have begged to question just what it was that happens when our physical bodies cease to exist for millennia. Why, we would not be human if we did not think on such things, as it was with higher conscience we evolved to walk as we do now. To me, zombies are simple. Zombies represent the most primal instincts within humanity. The animalism presented in their actions, their conscience and desires are what take us back to that fateful age when, thousands of years ago, all we craved was food and survival. We were, however, driven by instinct to protect ourselves. Unlike zombies, we have always had fear to inhibit and hold us back. It is not without reason that as children we are afraid of the dark, as during the night it is said that monsters will rise from under the bed to destroy all that it we feel is safe, and it is not without consequence that we are afraid to commit actions that would otherwise land us in severe trouble. That is perhaps the most terrifying thing about the zombie. Their no-holds-barred, unrestrained behavior when they attack their prey is akin to a predatory instinct that we have long since evolved away from. Sure—we may still hunt our prey on occasion, but we most often do so with simple guns and ammo, possibly even bows and arrows should we be willing to return to our former roots in our ways of hunting. There are very few occasions when we actually physically hunt our prey with tooth and claw—which, to the rest of the animal kingdom, seems outrageous. We were created as omnivores for a reason, to find and seek and hunt and kill the prey and foods that we eat. It is terrifying to think that, once upon a time, we were no more than animals, which is why, in my opinion, people are afraid of zombies. It is not about a lack of conscience, the loss of memories or even the desire to kill those we love—it is the return to animal roots that make them the most frightening. 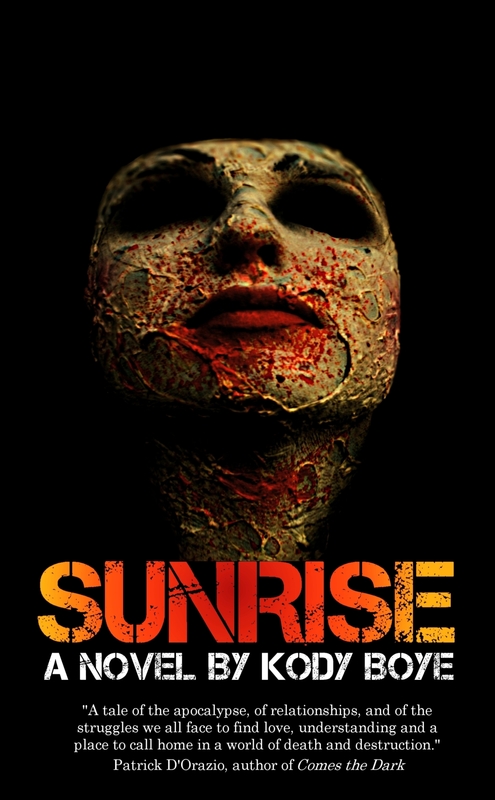 Kody Boye’s zombie novel, Sunrise, is now available on Smashwords.com and on Amazon in paperback formats (with Kindle forthcoming.) You can find more about him and his future projects by going to KodyBoye.com.